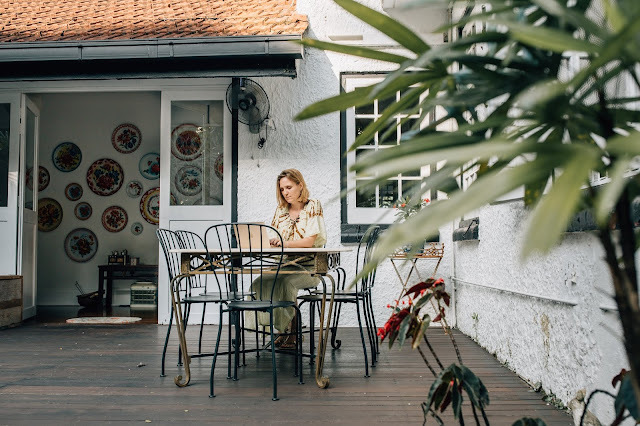 After a childhood of moving around Asia, the Middle East and Europe, Karien van Ditzhuijzen moved to Singapore in 2012. Karien has a degree in chemical engineering, but gave up her career developing ice cream recipes to become a writer. She now dedicates her life (in no particular order) to advocating migrant workers’ rights, her family, her pet chicken and being entertained by monkeys while writing at the patio of her jungle house. As a freelance writer and blogger Karien contributes to several publications in Singapore and the Netherlands. In 2012 she published a children’s book in Dutch recounting her childhood in Borneo. 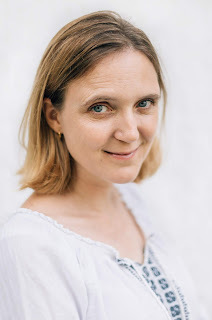 Karien van Ditzhuijzen’s debut novel A Yellow House was published by Monsoon Books in 2018. This poignant coming-of-age story, told in the voice of inquisitive ten-year-old Maya, explores the plight of migrant domestic workers in Singapore and the relationships they form with the families they work for. Karien has been working with migrant domestic workers since 2012, when she joined HOME, a charity that supports migrant workers in Singapore. In the following years Karien worked closely with domestic worker writers, documenting their stories and sharing them on the blog www.myvoiceathome.org and as editor of the anthology 'Our Homes, Our Stories'. The strong women Karien met through her charity work were the inspiration for A Yellow House. E: E: Welcome to AsianBooksBlog, Karien. A pleasure to have you. Perhaps we can start of with your interesting background. How long have you been in Singapore? I read in your bio that you have a degree in chemical engineering. What led to the turn towards creative writing and fiction? K: After living in the UK for six years, and the Netherlands before that, I was yearning to come back to tropical Asia – I have lived here as a child. So when I found out my husband’s company had an office here, I pestered him until he managed to get transferred. We have been here more than six years now, a personal record for me as I usually moved every three years when I was younger. Living here on a dependent pass meant I was free from needing to make an income for a while, so I could pursue a childhood dream; to become a writer. E: Let’s talk about the genesis of A Yellow House. K: When we moved to Singapore I knew already that I wanted to write about domestic workers. I grew up in Asia with ‘amahs’ in the house, and a lot of questions that I never asked at the time kept playing through my mind. What prompted them to leave their children behind and work overseas? What challenges did they encounter? And what were their hopes and dreams for the future? Being a perpetual migrant – a nomad - myself, labour-migration is a subject that fascinates me and these women are a group we don’t hear much from, yet their stories are so compelling. I wanted to give them a voice. E: It seems the title has a special significance? K: I used to teach empowerment workshops at a shelter for ill-treated domestic workers. One of the games we played was ‘the lottery’, where we’d brainstorm what we would do if we won 1 million dollar. The first thing almost all the women mentioned was building a house for their family. What these workshops showed me is that even though our lives might be different, we all share the same dreams. A house, an education for our children. To travel and see the world. 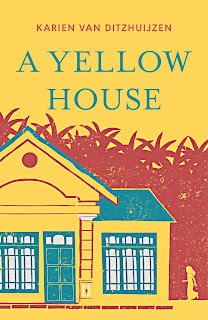 In the book, the yellow house is what Aunty M, the main domestic worker character, wants to build for her daughter Nurul in Indonesia. It is the reason she came to Singapore. And the ‘real’ yellow house exists already! When I visited my own helper Indah’s village in Indonesia, we saw the house she built from her Singapore wages. I sent a picture of Indah’s house to the publisher and the beautiful cover design of the book was inspired by it. E: How did you settle on the voice of the protagonist, Maya, who is a ten-year old girl of mixed parentage, to tell the story? K: K: I struggled a bit at first to find the right protagonist. I did not want the cliché of a western or local woman sweeping to the rescue, and felt a domestic worker protagonist would not offer enough space for reflection. A child is not judgmental and I could let Maya ask all the awkward questions I never asked as a child. I made her of mixed heritage as that allows her to look at things from different cultural perspectives. Maya’s Singaporean mother and Peranakan grandmother provide a link to modern and historic Singapore and give the story a sense of place. E: What were some of the challenges you overcame in getting the voice of Maya right, not just her age, but also her mixed-race heritage? K: K: I set Maya’s age at ten so she’d be on the cusp between childhood and adulthood. If she were a little older, she would have lost her innocence, if she were younger she would not have understood some of the issues the ‘aunties’ face. Some readers feel Maya is a bit precocious, but I think it works - as a child coping with bullying and a stressed-out mother she is forced to think about very adult themes – in fact, the adult reader will understand more than Maya herself. Although I am not mixed race myself, I have lived in so many different countries both as a child and an adult, that Maya’s struggles with her identity and multiculturalism are very close to me. E: E E: What was the process of researching the book like? Are there funny anecdotes you'd like to share? But I love socialising with these women; everyone shares food, stories and music. You get to know people better by having fun with them instead of just doing serious research. When you build a genuine relationship and show your own vulnerabilities, people are more likely to open up. E: Food plays an important part in this book, not just the rendang that the bonding process between Maya and their helper Aunty M, but also the pineapple tarts that were meant to carry on a Chinese New Year family tradition. Was there a lot of recipe hunting and experimenting with cooking rendang and making pineapple tarts during the writing of this book? K: When Indah first started working for us I asked her if she could teach me to cook rendang – as an Indonesian I assumed she’d know how. But she became quite shy and said she had never made it; when she was growing up they were too poor to afford beef. Over the years Indah has been perfecting her rendang recipe, she is an amazing cook! I love how Indah teaches me to cook my favourite Indonesian dishes, cooking is definitely a great way to bond. I shared her recipe on my personal blog (http://www.bedu-mama.com/2018/08/beef-rendang.html ) and it became quite famous! E: School bullying is also a theme within this book. Did you intend for it to act as a kind of mirror of migrant exploitation? K: Yes, I think both school bullying and migrant exploitation are forms of power play and power imbalance. I am hoping the comparison shows people that this type of behaviour is childish and we should try to get past it. E: It says in the Acknowledgement that you write from your jungle house. How intriguing! What's your writing space or day like? K: We live in this colonial ‘Black and White’ house that we rent from the Singapore government. It sits in a very green area – readers might recognize it as Maya’s friend Cat’s house in the book. I love working outside where the only music I hear are the birds and cicadas. Many animals find a way into my writing: simply because they literally walk or fly by as I write! I work best in the morning, by afternoon I am getting tired and my noisy kids are too disturbing when back from school. E: What literature has influenced you the most, or that has influenced the writing of this book? K: I read a lot, and recently have been reading a lot of local literature. Singlit is great! I can’t say any books influenced this book specifically, but favourites include Amanda Lee Koe, Christine Suchen Lim, Alfian Sa’at, and in the region writers like Tash Aw or Laksmi Pamuntjak. Internationally I love Isabel Allende and Kader Abdolah. E: Did you have hopes or expectations regarding your intended audience? Which demographic did you most want to reach out to? K: I tried to write a book that would appeal to readers in Singapore; many books about similar subjects tend to be written from an ‘expat’ perspective. My greatest compliment about this book was when local friends said I really ‘got’ Singapore, that it was a truly Singaporean book. My aim is not to judge, but to make people think about how migrant workers get treated here. They can draw their own conclusions. E: Tell us about your important work with migrant workers here in Singapore. K: Over the years I had a number of different roles with HOME. I started helping out at their helpdesk for ill-treated domestic workers and managing the volunteers. Later I started teaching workshops (empowerment and creative writing) at HOME shelter and set up a befriender program there. I got quite carried away, at some point I even found myself managing the shelter and being in charge of day-to-day affairs. I then took a step back to focus on writing projects. In 2014 I started the MyVoice blog (www.myvoiceathome.org), a platform for migrant workers to share their stories and earlier this year I edited the anthology ‘Our Homes, Our Stories,’ a book with 28 real-life stories all written by domestic workers. HOME is well known for its helpdesk and shelter, but what many people don’t know is what an amazing community it offers for domestic workers living here in Singapore. We have a large group of domestic workers that spend their one Sunday off volunteering. They teach, organize events, dance, sing, visit the sick, and much, much more. I met a huge number of amazing women there that are now my friends, an experience that has made my stay in Singapore so much richer. Thank you for joining us, Karien! 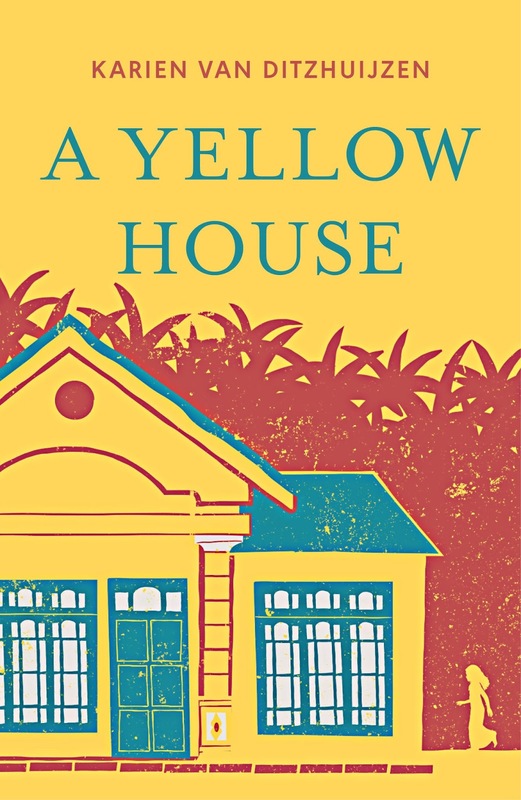 NB: A Yellow House (Monsoon Books, 2018) is available from all local Singapore outlets (Kino, Popular, Times) and online retailers (Amazon, Kobo etc).